London, 22 October 2014 (Alochonaa): Ibn Khaldun (1332-1406) and Karl Marx (1818-1883) are separated by five centuries of history and two civilizations and yet they exhibit some very important similarities. I discovered this when I was undertaking my Master of Arts (MA) studies in Political Thought at the University of Kent, UK. I realised that they both believed that history was dynamic, consisting of various periods that were qualitatively and quantitatively different from each other, implying movements. Marx presented a picture of history which was progressive, according to which each stage of history was superior to the preceding one, whilst Ibn Khaldun’s theory of history exhibited cyclical patterns. Ibn Khaldun was a 14th Century North African thinker who produced remarkable works on human history, sociology and historical change, to name but a few. He is best known for his book entitled Muqaddimah. This work was the result of an exploration of how to write an accurate account of history, before he embarked on writing a history of the world. 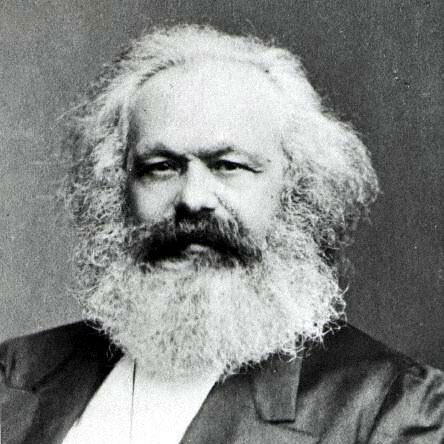 Karl Marx was an 19th Century thinker who wrote many works on society, economics, social and historical change and capital. He inspired the rise of socialism and communism around the world during the 20th century and his works have influenced a number of branches of academic studies. 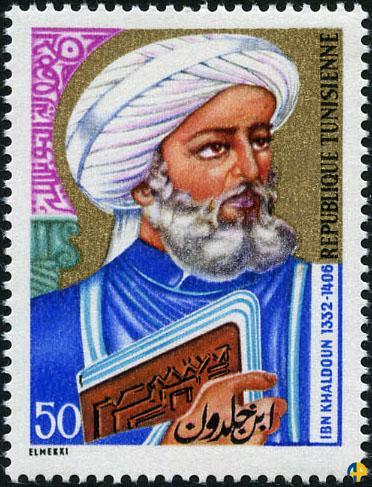 A stamp bearing the image of Ibn Khaldun (Google image). Although neither Ibn Khaldun’s nor Marx’s theories of history were original, they differ significantly from earlier writings on historical change. Even though the cyclical and progressive conceptions of history did not begin with Ibn Khaldun and Marx, the real originality of their analysis of history lies in their approach, their method of investigation of the subject matter and the conclusions they reached. They both tried to understand the underlying causes of social change, and made painstaking efforts in this regard by gathering information on humanity’s experiences since the dawn of history. They both discussed what they thought to be the first form of society (in terms of what it was like), gave rational explanations for its existence and how that changed over time. I will now compare and contrast the core central ideas and concepts, in relation to history and historical change, in the writings of Ibn Khaldun and Marx. Men as social and political beings According to Ibn Khaldun men are political by nature. This is because, by necessity, men organise themselves into groups and co-operate together in order to meet their needs. One man on his own cannot provide for all his needs, but when men get together and co-operate they produce more than enough for their needs. Ibn Khaldun states that even to provide for a day’s food, such as a small amount of wheat requires ‘grinding, kneading, and baking’. Each of these operations requires utensils which can only be provided by three different crafts. He further states that even if we assume that a man could eat unbroken grain he still needs to cultivate and harvest the crop, which are impossible tasks for one man to perform. However, when men come together and cooperate they satisfy the needs of a number of people many time greater than their own. A production of surplus leads to the creation of civilisation. Similarly, according to Marx, the ‘individual is a social being’ and to be human is to have consciousness and “Consciousness is… from the very beginning a social product, and remains so as long as men exist at all.” Men, in order to meet their requirements for food, drink, clothing and shelter, co-operate with each other to produce them. By satisfying these essential needs, they create new needs and increase their numbers. Through these social activities men achieve consciousness. The presence of slavery in the latter and its absence in the former. According to Marx, a tribal community is characterized by an undeveloped stage of production. The notion of the all important role of the ‘productive farces’ is absent in Ibn Khaldun’s theory. However, according to Ibn Khaldun, the early community, which was tribal, was founded by the co-operation of men, both in producing their survival needs and providing mutual protection from dangers, such as wild animals. The co-operation of men in production is, in Marx’s theory, a productive force. Therefore, even though the term ‘productive forces’ is absent in Ibn Khaldun’s theory, its importance is clearly there. Ibn Khaldun did not have a precise and rigorous grasp of this term, which is understandable, considering that he lived five centuries earlier than Marx and how people worked to make ends meet changed over that period. The important role of ‘asabiya’ in the formation of society, which is mentioned in Ibn Khaldun’s theory, is absent in Marx’s. The term ‘asabiya’ refers to a form of group feeling and group solidarity. Some experts have suggested that the term could bear resemblance to modern day terms such as ‘patriotism,’, ‘national awareness’, ‘group cohesion’, ‘common will’ or ‘solidarity in the strongest sense’. Evolution of society Both Ibn Khaldun and Marx believed that history was dynamic, that it evolved from one state to another and the source of this movement was internal. The nature of the movement was such that one state of human life evolved into other states. According to Ibn Khaldun, history begins with ‘umran badawi’, moves to ‘umran hadari’, and then eventually returns to ‘umran badawi’. The term ‘umran’ means civilization or culture or a state of living together where people cooperate with each other through necessity and or blood ties with its values, rules, boundaries, rituals, etc. ‘Badawi’ is the earliest form of culture or civilization which can be equated with primitive getting together or the earliest state of culture or civilization. ‘Hadari’ is the result of higher levels of surplus production and similar to advanced societies with cities and urban living with science, craft and sedentary living. The goal of ‘umran badawi’, according to Ibn Khaldun, was to reach ‘umran hadari’, but however not all groups in ‘umran badawi’ were capable of moving to ‘umran hadari’. This is because of their inability to develop strong ‘asabiya’. Only certain groups who are capable of developing a stronger ‘asabiya’, relative to other groups, can move towards higher states of culture and eventually to ‘umran hadari’. The process involves warfare where groups with weaker ‘asabiya’ are forced out of the process towards ‘umran hadari’. Ibn Khaldun thought that desert tribes were the best suited groups to develop strong ‘asabiya’ necessary for the required struggle to achieve ‘umran hadari’. However, when groups with strong ‘asabiya’ reach ‘umran hadari’, the life of comfort, art, science, sedentary living, etc., their ‘asabiya’ starts to weaken and eventually other groups with stronger ‘asabiya’ confronts them and defeats them and that is when they are forced to return to ‘umran badawi’ again. Similarly, Marx’s opinion is that history begins in a communistic society, moves first to a slave society, then to a feudal society, then to a capitalist society, and eventually returns to a communistic society. However, in contrast to Ibn Khaldun’s theory, in which the starting ‘umran badawi’ is more or less the same as the returned ‘umran badawi’, the starting communistic society of Marx’s theory is qualitatively different from the returned communistic society. Marx designated the former ‘primitive communism’, characterised by low level development of the productive forces, and the latter ‘ future communism’, characterised by high level development of the productive forces. Both are characterized by the common ownership of the means of production. The main difference between Ibn Khaldun’s and Marx’s theories of the evolving society is that, according to the latter, it is the ‘productive forces’ which is the real source of the internal mechanism responsible for the change and development, whereas in the former’s view, ‘ asabiya’ and not the ‘productive forces’ was the motor responsible for the historical developments and movements. Dialectics Given his deep knowledge of ancient Greece, it would be very surprising indeed if Ibn Khaldun was unaware of Aristotle’s concept of dialectical change. He himself wrote a book on Aristotle for the education of a son of a Christian king in Spain, when a small part of the country was still under Muslim rule. However, it is almost certain that he was unaware that ‘asabiya’ itself was a dialectical concept. This is a fair deduction because he made no mention of dialectical change in relation to the concept of ‘asabiya’. The concept of dialectical change is also a strong element in Marx’s theory of history. Dialectics is a central element in both Marx’s and Ibn Khaldun’s theory of history because both the ‘productive forces’ and ‘asabiya’ follow its laws. However, although dialectics plays the crucial role of bringing continuous change in both theories, Marx’s dialectical concept differs from Ibn Khaldun’s fundamentally. It can be said that they operate on completely different, or even opposite, planes. Ibn Khaldun’s dialectical concept of ‘asabiya’ operates at the mental level, while in contrast, Marx’s dialectical concept of the ‘productive forces’ operates on the material plane. Why do I consider ‘ asabiya’ and ‘productive forces’ to be dialectical concepts? I do so because any form of change is said to be dialectical if the change comes about in such a way where an internal element develops within a particular phenomenon, first challenges it and then negates it. Ibn Khaldun’s concept of ‘asabiya’ gives rise to a state (political government), and by this very act, initiates a process which brings about its death. In Marx’s theory, the concept of the ‘productive forces’ establishes a particular social system, and by this very act creates a force which, by necessity, resists its further growth without any success. The main difference between the two dialectical concepts is that, while the child (the state) of ‘asabiya’ manages to destroy it first and then is itself subsequently destroyed by this destruction, the child (the social system) of the ‘productive forces’ unsuccessfully resists the further growth of ‘productive forces’ and destroys itself in the process. According to Marx’s theory, there is no prevention of the growth of the productive forces. In contrast, Ibn Khaldun’s concept of ‘asabiya’ comes into existence, grows, reaches its peak, stagnates, declines, and then dies. Historical materialism The most important element of historical materialism, or the materialist conception of history, is that production ultimately determines all other spheres of human life, such as politics, art, philosophy, religion and culture, to name a few. Therefore, because Marx’s theory of history satisfies this condition, it is called ‘historical materialism’. Yves Lacoste points out and believes that there are elements in Ibn Khaldun’s Muqaddimah which anticipate historical materialism. For example, according to Ibn Khaldun: “It should be known that differences of condition among people are the result of the different ways in which they make their living.” And, according to Yves Lacoste: “Ibn Khaldun emphasizes the changes in political organisation, the appearance of new forms of intellectual life and the psychological changes brought about by the transition from ‘umran badawi to ‘umran hadari. “ It is true that a transition from umran badawi to umran hadari, according to Ibn Khaldun, causes changes in production techniques and the ‘social organisation’ for the co-operation in production, and as a result, determines the kind of life that people in the city live. Production techniques determine the amount of leisure and luxury that the ruling classes can enjoy, and consequently, also determine the intellectual life and the psychology of the people. However, this does not justify saying that Ibn Khaldun anticipated historical materialism, because according to the basic tenets of historical materials, production determines all other spheres, which is not the case in Ibn Khaldun’s theory of history. Although Ibn Khaldun described very different production techniques in umran badawi and umran hadari, the transition from the former to the latter is not effected by the changes in production techniques. The changes come about as a result of ‘asabiya’. A stronger ‘asabiya’ creates greater cities with greater luxury, refinement, culture, etc., which implies greater development of production. Therefore, because it is not production, but ‘asabiya’, which is central in Ibn Khaldun’s theory of history, to say that it anticipates historical materialism is not fully justified. Theory of ideology According to Marx, ideology is the false ideas and conceptions that people have, regarding men and society. It is not independently created, but is the result of a necessity existing, due to the existence of unequal distribution of social and economic power. It helps to justify social contradictions by covering up its essential relations. This is achieved by creating illusory images of reality. For example, the state claims to serve everyone by pretending that the interests of the individual coincides with the community. In fact, however, in capitalism the community does not have a common interest, the state serves only the interests of the ruling classes, and generates ideology in order to preserve the status quo. Therefore, ‘the ideas of the ruling class are the ruling ideas of every epoch’. According to Ibn Khaldun, at the early stages of achieving royal authority in a tribe, its ‘asabiya’ is strong, and there exists an egalitarian relationship between all its members, including the ruling family. However, with the increase in wealth and power of the ruler and his family, the egalitarian relationship is gradually replaced by one of vassal. The ruler fears the possible consequences of this, such as rebellions, and takes steps. He increasingly uses propaganda, such as the importance of blood ties and common ancestry, and takes the tribe to wars with other tribes. This helps to create an appearance of unity and tribal solidarity, and consequently conceals the real transformations which have taken place. Just like Marx’s famous statement regarding the ideas of every epoch, Ibn Khaldun states that “Behind each opinion and desire, there is a group feeling (asabiya) defending it.” Although Ibn Khaldun did not know the term ‘ideology’ as it was coined four centuries later by Antoine Destutt de Tracy in 1797, and popularised by Marx during the nineteenth century, it is clear that its concept in Marx’s sense was present in his mind. Otherwise how could he have scientifically discussed the differences between reality and false ideas created in people by their ruler? Of course, Marx’s theory of ideology is much more developed, rigorous and sophisticated than Ibn Khaldun’s. The roots of the two theories Ibn Khaldun expected history to continue to exhibit a cyclical pattern of movements well into the future. He did not think that there would occur a break in this pattern, because he believed it to be the nature of human history, and no one can change the course of nature. However, Marx expected a revolution to take place which he thought would totally transform the world, bring capitalism to an end and inaugurate an era of communism. He believed that no one could stop this outcome, because the developing productive forces were going to overthrow the fetters of capitalism. Historical developments to present time have shown that both Ibn Kaldhun’s and Marx’s predictions of how history were to develop are incorrect. Why did they get it so wrong, given the total faith they had that their predictions were based on scientific understanding of the process of history? In order to be able to answer this question, it is necessary to consider the environment in which these two theories were born. Although Ibn Khaldun talked about human social existence going through entire changes in time, it is almost certain that he did not think that humanity experienced progressive changes. He talked about past nations’ achievements surpassing any achievements later, by other nations, and criticized those who believed that great buildings and monuments were built by much bigger and stronger people than themselves. According to Ibn Khaldun, the achievements of past nations were the result of stronger ‘asabiya’, power and wealth. It is clear that Ibn Khaldun could only conceptualise about the world in terms of its experiences. He wanted to explain why and how things were as they were observed and studied by him. History did not provide him with any materials from which he could develop a conception of change other than cyclical. Or his imagination, based on his experience and readings of history, kept his mind completely within the bounds of cyclical patterns in history. Even though he discussed other parts of the Muslim world in his writings, for example, Egypt, Syria and Iraq, Ibn Khaldun did state that he had deep knowledge of North Africa only. Europe’s rise in power and its contact with various places, civilizations and native peoples around the world helped the development of a progressive conception of history, which saw Western man as the latest in the development of humanity. Marx was influenced by this conception of history. In his studies, Marx observed what he thought were distinct phases in European history, characterised by a particular development of the productive forces and corresponding relations of production. The French Revolution had a powerful influence on Marx, who interpreted it as the logical outcome of the development of the productive forces coming into conflict with outdated relations of production. The revolution was a victory for the bourgeoisie and the establishment of a relations of production suited to the new forces of production. Marx concluded that, with the further growth of the productive forces, the bourgeois relations of production would become its fetters, and would be replaced by a violent communist revolution. A new communist relations of production would be established. According to Marx, this relations of production will be based on the common ownership of the means of production. Since, from Marx’s studies, all the previous stages of history were brought to an end, he could not conceptualise a phase, such as capitalism, which could have within itself the capacity to stay alive and make great advances. Who knows, it may be that one day capitalism will also be replaced, but nobody can predict accurately how capitalism will develop in the future. What is clear is that no accurate prediction can be made about history based on past experience. Karl Popper makes this point convincingly in The Poverty of Historicism when he stated that: The most careful observation of one developing caterpillar will not help us to predict its transformation into a butterfly. *Muhammad Ahmedullah holds a PhD on Epistemology and Political Theory from University of Kent, UK. He has since worked for many years in inner city regeneration programmes in the UK. Between May 2005 and June 2010 he delivered an unique exhibition on Dhaka City in and around London. He is also the secretary of Brick Lane Circle, an organisation based in London that runs academic events to help transform the intellectual landscape of the Bangladeshi community in the UK.